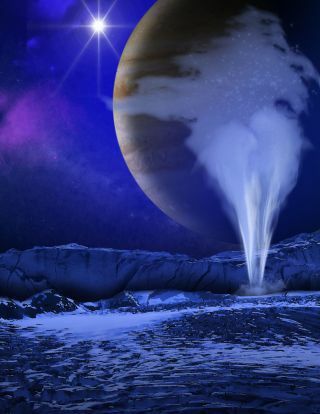 This artist's concept image depicts a water vapor geyser erupting from the surface of Jupiter's icy moon Europa. The huge plumes of water vapor erupting from Jupiter's ice-covered moon Europa seem to have vanished, and scientists aren't sure why. In December 2013, researchers using NASA's Hubble Space Telescope announced that they had spotted evidence of geysers blasting into space from Europa's south polar region. The discovery sparked a great deal of excitement among space scientists, as it suggested that a robotic flyby probe might be able to sample Europa's subsurface ocean of liquid water without even touching down. There are several possible explanations, researchers said. For example, Europa's geysers may be sporadic — more like volcanoes here on Earth than the plumes blasting pretty much constantly from the south pole of Saturn's icy moon Enceladus, which harbors a subsurface ocean like Europa. It's also possible that Europa's plumes are only visible to Hubble's instruments at certain times. "It could be just the way that we use the auroral emissions coming from those plumes at the UV [ultraviolet] wavelengths of light that we use with Hubble," discovery team member Kurt Retherford, of the Southwest Research Institute in San Antonio, told Space.com. "These things depend on Jupiter's plasma environment," Retherford added. "Maybe there were just a lot of particles, atoms, getting excited by electrons and ions in Europa's atmosphere, more so than at other times, and [they] just lit up the plumes more than they usually do." This NASA image shows the location of water plumes on Jupiter's icy moon Europa as seen by NASA's Hubble Space Telescope in December 2012. The discovery marked the first time strong evidence of water geysers on Europa. Another possibility is that the geysers don't exist, that the detection by Hubble, which was based primarily on observations the telescope made in December 2012, was an artifact or misinterpretation of some sort. But Retherford stressed that this is unlikely. "The best explanation still is plumes for that dataset, no doubt about it," he said. Retherford and his colleagues are going to look for the plumes again soon. They'll train Hubble on Europa from November through April, in a more comprehensive attempt to confirm the existence of the water-vapor geysers and to characterize their behavior. "The question is the variability aspect of the plumes. Why do we see them in some observation sets and not others?" Retherford said. Learning more about the plumes is a key priority for astrobiologists and for NASA, which is eyeing a mission to Europa in the mid-2020s. The leading candidate for that mission at the moment is probably a probe called the Europa Clipper, which would make multiple flybys of the icy satellite. "This is the kind of thing that could have a profound impact on how we explore Europa," Curt Niebur, outer planets program scientist at NASA headquarters, said during a NASA planetary sciences subcommittee meeting Wednesday (Sept. 3). "With an ocean that is tens of kilometers below the ice, most likely, if you can have a plume that's possibly bringing material from that ocean up to orbit, well, that's going to affect how you explore," Niebur added.